Article first published as TV Review: BARRY on Seat42F. BARRY, a new comedy on HBO, is the story of a hitman named Barry who accidentally attends an acting class and decides he wants more from his life than being an anonymous killer. 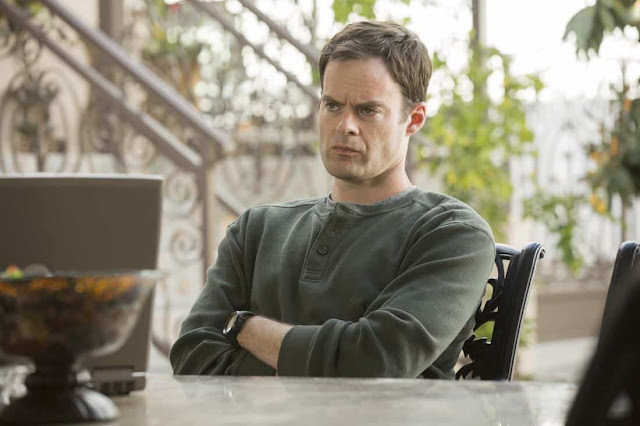 Starring Saturday Night Live’s Bill Hader in the title role, BARRY is more than just a dark comedy. It’s the story of a man who has been manipulated and lost, looking to figure out who he is and take hold of his own path once more. But it’s not so easy to quit being a murderer, especially when your boss doesn’t want to let you go. Hader is excellent and understated in the role. Known for playing over-the-top characters, as most SNL vets are, Barry is a quieter role for the actor. The character description is colorful, but in actuality, Barry is awkward in a calm way. He isn’t a good actor, but we find that out not through a huge, splashy screw up, but from quick, low line reads. Even his breakdown at the end of the first episode is more moving than loud, giving us a glimpse into the tortured soul. It’s a little exposition-heavy, but it tells viewers frankly who Barry is and why. The premise is goofy, but it isn’t played as such. The criminals are deadly serious. The actors are hopelessly earnest. The acting teacher, a terrific turn by Henry Winkler (Happy Days, Arrested Development), is a familiar type, but because he’s played by Winkler, will surely be more than that. In tone, it is closer to other HBO series than something on a broadcast network. But it isn’t as quirky as some of its peers. Where the show gets the biggest is in the violence, but those sequences are quick, not drawn out. The blood probably isn’t more than there would be in real life. Interestingly, the first time a dead body is shown, we just see Barry in the aftermath, and there’s a certain amount of disconnect between him as he is portrayed and the scene. Later, we witness his true skills, and we see why Fuches (Stephen Root, Brooklyn Nine-Nine, Justified) doesn’t want to let Barry quit. There’s also a bit of a love story between Barry and his enthusiastic classmate, Sally (Sarah Goldberg, Hindsight). But again, it’s more of a subtle thing. I mean, the attraction, at least on his end, is obvious. But it’s not like they talk about it or spend needless minutes flirting. Barry is too socially inept to say anything to her, and she just seems like a warm, welcoming person. I hope BARRY doesn’t go there with them, as the journey will be richer if it’s just about Barry’s inner growth, and not fueled by sexual chemistry. But it seems quite likely that this will be dealt with more overtly later. I admit, I’m surprised to see Hader in a role and program like this. It’s true that some of the best comedic performers make great dramatic actors because they understand human emotion on a deep level. Hader appears to be no exception, creating an odd character that is both familiar and unique. I’m very interested in the portrait of the man being painted here, story aside, though the narrative is intriguing, too. It seems the perfect vehicle for him, like Flaked was for Will Arnett, showcasing range in a part that didn’t feel like a natural next step for the actor, but it quickly becomes apparent no one else could play it on the same level. I don’t want to oversell it. I don’t think BARRY is the next huge hit. But I do think it’s a worthy premium cable entry that will make for a fascinating watch. BARRY airs Sundays at 10:30PM ET on HBO.